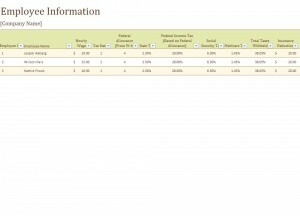 A payroll calculator template is a great tool to have for any type of business. It allows businesses to create paycheck stubs and figure out employee’s paycheck amounts quickly. The employee number. List of all the employees on payroll. The third page will figure all the math from the first two pages to make a paycheck stub for the employees. The paycheck stub will have all the required information that was used in order to figure the pay check amount. The company can use the template to help them with creating paycheck stubs for their employees. The payroll calculator can easily be updated for the employees needed. This way if the employee received a raise or bonus, it can be entered into the template for future use. The company name and proper dates will need to be listed on the template when it is being used. This way the check stubs will show the dates they were finalized or created. The chart can be changed to fit your company needs. Some states may vary from another and the accurate figures will need to be put in the chart for the state taxes that are suppose to be deducted. Our payroll calculator template can be downloaded for free right off of this page. It is easy to use and can be customized to fit your needs for your company. Be sure to download your free template today.